Digital Photography School (DPS) recently released Natural Light: Mastering a Photographer’s Most Powerful Tool by photographer Mitchell Kanashkevich. This beautiful e-book is so inspiring it just could be the thing to get you out of a rut,take off your flash and go outside and create amazing natural light photos with your camera. Kanashkevich takes you thru a visual journey of captivating images he's created explaining the types of natural lighting scenarios you will encounter and how he approached the situation as he photographed it and how he improved the images in post processing to better bring out shadows and highlights. Looking at his images I imagined that some photographers would see certain scenes and instantly pull out a flash unit killing the whole meaning of the situation or turning dusk into a boring overly lit image that lost the whole point of why it should have been photographed. The ebook is beautifully laid out in ebook format which you can read on your computer or any of your devices like an iPad,iPod or iPhone. I've not photographed the incredible situations that Kanashkevich has but I've photographed hundreds of concerts back in the day.I'd notice that the lighting designer often was very skilled in positioning the color,and type of light that went with each song and perfectly sculpted the singer or band int the most expressive light.Then comes along a photographer with a blinding flash in a quiet moment only to wake up the dead with a blast of light but killing off any resemblance of what the stage show was meant to look like. Though this book does not cover that type of situation,it was a reminder to be mindful of what is before you and creating the best of what you can with just your camera and lens. Mother nature is only one light that twists and turns,hides,wraps around and bends and can light as no human can! This book is so inspiring,I will put my new Olympus OM-D and Leica lenses thru my own natural light adventures after reading this inspiring book. For more info and purchase info,click on the link below. With less than one week remaining until the start of the Taste of Chicago, the Department of Cultural Affairs and Special Events is reminding music fans that tickets are available for purchase online until Monday at midnight, and then available for purchase onsite on the day of the show. For only $25, festival goers can have a seat in the pavilion at the band shell for headline performers Jennifer Hudson; Death Cab for Cutie; Michael Franti & Spearhead and Fitz & the Tantrums; Chaka Khan and Dierks Bentley at the Taste of Chicago, July 11-15. Thus far, more than 5,637 tickets have sold for the event. Lawn seating for up to 30,000 people remains free of charge. In addition, only a few seats remain for the Celebrity Chef du Jour on Sunday, July 15. Culinary fans can join Jimmy Bannos of Heaven on Seven for a three-course, sit-down meal in a specially decorated, air conditioned dining pavilion that for an advance ticket price of $40 per person. The mean will include Poached Louisiana Gulf Shrimp on a Fried Green Tomato with a Lemon Remoulade and Micro Greens; Pan Seared Chicken Thighs with Andouille Sausage,Summer Tomatoes, Basil and a Balsamic Reduction and Blueberry Bayou Blasters. The 32nd Annual Taste of Chicago features 40 different food booths vending over 200 menu items each day including the new Pop Ups feature. Each day three new restaurants that are also new to Taste will appear in booths numbered 22-24. Those include such diverse restaurants as Jin Ju, Garifuna Flava Caribbean Restaurant and Karyn’s on Green. Become a fan of Taste on Facebook at Taste of Chicago or follow the event on twitter at @tasteofchi2012. One month to go until submissions for the 2012 festival close. The mission of The Trailer Festival is to sell films and scripts to the entertainment industry, with whom we have direct contact. The first two events were attended by industry exclusively and included Fox, Disney, Paramount and PBS. After each festival the trailers are placed in an Online Screening Room and for a year after the event Hollywood managers, producers and distributors log in to view filmmakers' work. *To be removed from our database please reply to this email with Remove in the subject. PLEASE USE THE EMAIL ADDRESS WE SENT TO. Thanks. Only two weeks left to submit your best photographs and seize the opportunity to put your work in front of over 70 international photography professionals, to exhibit your work during the Tenth Annual Lucie Awards event / Lucie Week in Los Angeles, and to compete for $20,000 in prizes! 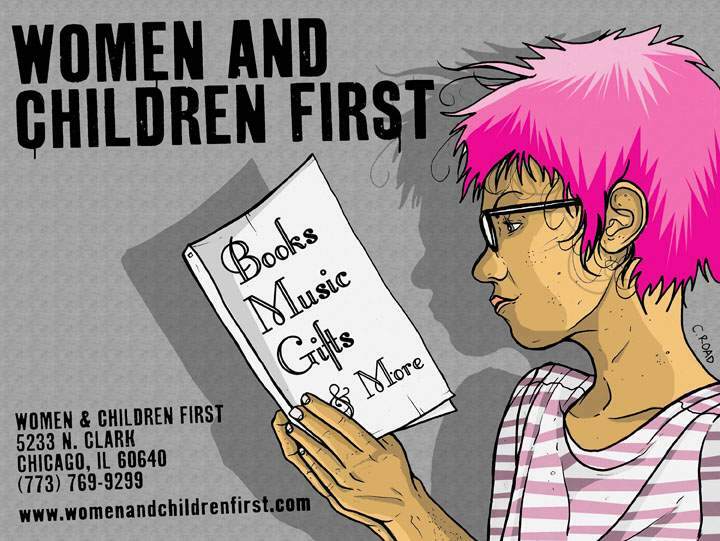 Do you love sunshine, books, and Women & Children First Bookstore? Volunteers are needed to help us during our annual used book sale (July 28 and July 29). Meet nice people, enjoy fun in the sun, and have first pick of the goods. pitch in for a three-hour shift on Saturday, July 28, or Sunday, July 29, we would really appreciate it. keeping them straightened up--and, of course, helping customers and selling books!